Disruptive changes to business models will have a profound impact on the employment landscape over the coming years. Many of the major drivers of transformation currently affecting global industries are expected to have a significant impact on jobs, ranging from significant job creation to job displacement, and from heightened labour productivity to widening skills gaps. In many industries and countries, the most in-demand occupations or specialties did not exist 10 or even five years ago, and the pace of change is set to accelerate. By one popular estimate, 65% of children entering primary school today will ultimately end up working in completely new job types that don’t yet exist.1 In such a rapidly evolving employment landscape, the ability to anticipate and prepare for future skills requirements, job content and the aggregate effect on employment is increasingly critical for businesses, governments and individuals in order to fully seize the opportunities presented by these trends—and to mitigate undesirable outcomes. Past waves of technological advancement and demographic change have led to increased prosperity, productivity and job creation. This does not mean, however, that these transitions were free of risk or difficulty. Anticipating and preparing for the current transition is therefore critical. As a core component of the World Economic Forum’s Global Challenge Initiative on Employment, Skills and Human Capital, the Future of Jobs project aims to bring specificity to the upcoming disruptions to the employment and skills landscape in industries and regions—and to stimulate deeper thinking about how business and governments can manage this change. The industry analysis presented in this Report will form the basis of dialogue with industry leaders to address industry-specific talent challenges, while the country and regional analysis presented in this Report will be integrated into national and regional public-private collaborations to promote employment and skills. The Report’s research framework has been shaped and developed in collaboration with the Global Agenda Council on the Future of Jobs and the Global Agenda Council on Gender Parity, including leading experts from academia, international organizations, professional service firms and the heads of human resources of major organizations. The employer survey at the heart of this Report was conducted through the World Economic Forum’s membership and with the particular support of three Employment, Skills and Human Capital Global Challenge Partners: Adecco Group, ManpowerGroup and Mercer. This Report seeks to understand the current and future impact of key disruptions on employment levels, skill sets and recruitment patterns in different industries and countries. It does so by asking the Chief Human Resources Officers (CHROs) of today’s largest employers to imagine how jobs in their industry will change up to the year 2020—far enough into the future for many of today’s expected trends and disruptions to have begun taking hold, yet close enough to consider adaptive action today, rather than merely speculate on future risks and opportunities. While only a minority of the world’s global workforce of more than three billion people is directly employed by large and emerging multinational employers, these companies often act as anchors for smaller firms and local entrepreneurship ecosystems. Therefore, in addition to their own significant share of employment, workforce-planning decisions by these firms have the potential to transform local labour markets through indirect employment and by setting the pace for changing skills and occupational requirements. This Report aims to serve as a call to action. While the implications of current disruptions to business models for jobs are far-reaching, even daunting, rapid adjustment to the new reality and its opportunities is possible, provided there is concerted effort by all stakeholders. By evaluating the future labour market from the perspective of some of the world’s largest employers we hope to improve the current stock of knowledge around anticipated skills needs, recruitment patterns and occupational requirements. Furthermore, it is our hope that this knowledge can incentivize and enhance partnerships between governments, educators, training providers, workers and employers in order to better manage the transformative impact of the Fourth Industrial Revolution on employment, skills and education. 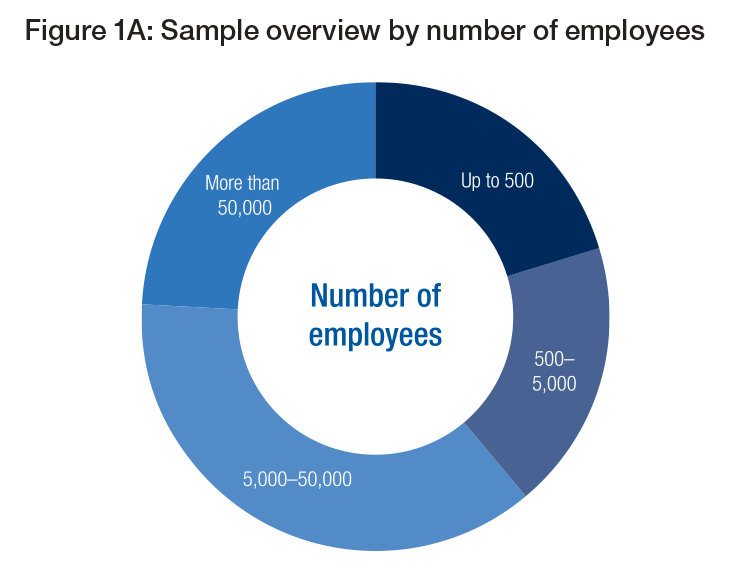 A quarter of the companies surveyed employ more than 50,000 people globally; another 40% have between 5,000 and 50,000 employees; the remaining third is equally split between employers with 500 to 5,000 staff and high-growth companies with currently up to 500 employees. 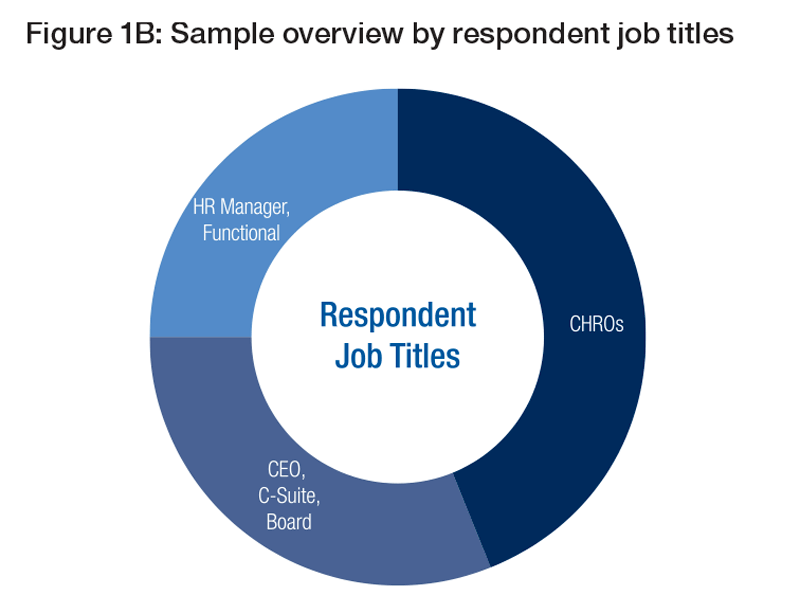 Nearly half of our respondents identified themselves as the Chief Human Resources Officers (CHROs) for their companies at the global level; another third identified as C-suite or board level representatives of their organizations; and the rest identified as strategy officers or human resources line managers, country directors or functional leads. While the majority of the large employers in our sample have worldwide operations and employee bases, including in several or all of the focus countries of our survey, they are typically headquartered in a more limited number of these countries. To ensure geographical balance, our sample pool included at least 50 companies each from our list of target geographies. We only report country-level findings when we have at least 30 unique data points on local employees in that country. 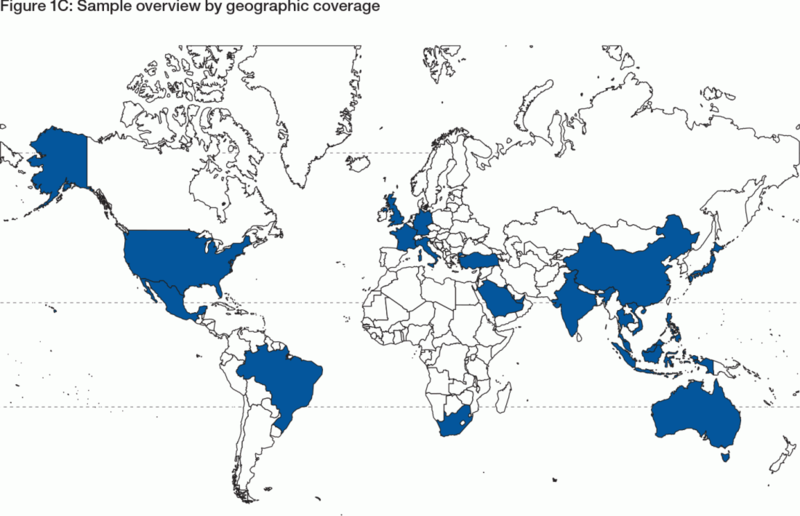 Accordingly, the countries and economic areas covered in-depth by the Report are: the Association of Southeast Asian Nations (ASEAN), Australia, Brazil, China, France, Germany, the Gulf Cooperation Council (GCC), India, Italy, Japan, Mexico, South Africa, Turkey, the United Kingdom and the United States (Figure 1C). In addition, our survey sample was constructed on the basis of nine broad industry sectors as defined by the Wold Economic Forum, with a view to balanced industry results in terms of number of companies and employees represented. For each sector, our target list of respondents identified the leading large and emerging employers in that industry (see Appendix A: Report Methodology for details). Our analysis groups job functions into specific occupations and broader job families, based on a streamlined version of the O*NET labour market information system widely used by the US Department of Labor and labour market researchers worldwide.3 In addition, we asked respondents to provide a gender breakdown for the employee functions they listed. The geographic balance of our sample enables a nuanced view on the outlook for job functions in different countries and industries, covering both white-collar and blue-collar workers, and both high-income and low-income countries. Demographic, socio-economic and—increasingly—technological trends and disruptions to the business and operating models of global companies have the potential to rapidly change the dynamics of the global employment landscape. In addition to the outlook for existing roles, we asked respondents to tell us about wholly new occupations and fields of specialization they expect to emerge in their industries as well as those they foresee to be made obsolete over the coming years until 2020. This Report consists of two parts. Part I explores the future of jobs and the pace of change to the global employment landscape up until the year 2020, as anticipated by the CHROs of some of the world’s largest employers. It touches, first, on the expected trends, disruptions and drivers of change transforming business models in every industry, with far-reaching implications for skills, jobs and the nature of work. It then reviews the expected effects on employment levels and skills profiles in different job families, industries and geographies. It discusses consequences of these changes for the adequacy of existing talent and workforce strategies. Finally, in a dedicated chapter, it explores the implications of today’s transformations on the future of women’s workforce participation. Part II of the Report presents our findings through an industry, regional and industry gender gap lens—highlighting key industry-by-industry and region-specific trends—and provides a wealth of industry-specific and country-specific practical information to senior decision-makers and experts through dedicated Industry Profiles, Country and Regional Profiles and Industry Gender Gap Profiles. Finally, a detailed Methodological Appendix provides further information on our survey design, sample selection criteria and research methodology. 1 McLeod, Scott and Karl Fisch, “Shift Happens”, https://shifthappens.wikispaces.com. 2 The structure of our survey means the base sample—the unique data points that can be used for our analysis—commonly refers to these 1,346 occupation-level responses, although in some cases it is restricted to the 371 company-level responses. For details on our survey design, or any of the other points discussed in this section, please refer to Appendix A: Report Methodology. 3 Please refer to: www.onetonline.org. 4 See Autor, D., 2013.